The Errol Heights neighborhood located in SE Portland, like many others, includes unpaved streets troubled with stormwater runoff. This caused significant rutting to the existing right-of-way, damage to adjacent private properties, and contributing undesirable sediment to nearby Johnson Creek. GreenWorks has been actively engaged with representatives from BES, PBOT and PP&R to provide innovative alternative approaches to these conditions, dissimilar from standard solutions for stormwater management. The Errol Heights project will not only provide innovative methods for resolving its current issues, but will also serve as a model for other Portland area neighborhoods to apply similar strategies. GreenWorks analyzed the downtown area of Bingen, Washington which is a small community in the Eastern Columbia River Gorge. It is a community which attracts tourists, recreationists and windsurfers in the Gorge. 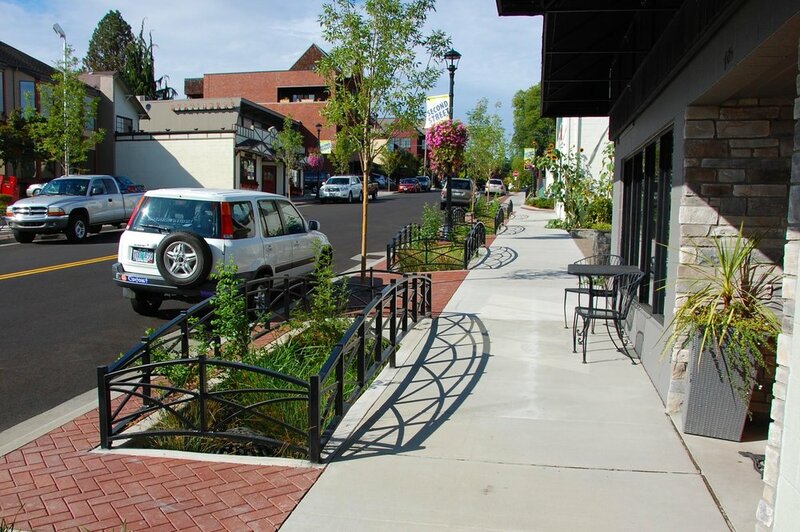 GreenWorks helped develop recommendations to revitalize the downtown core with streetscape improvements, pedestrian amenities and design of civic spaces. We compiled the analysis and recommendations in a comprehensive report which was used to seek funds for implementation. This sustainable housing and mixed-use, 32-acre project spearheaded the redevelopment of the 275-acre former Fairview Training Center site in southeast Salem. The project incorporates sustainable design concepts for both the building types and the public infrastructure. As part of an interdisciplinary team, GreenWorks implemented a wide range of project objectives related to sustainable site design. 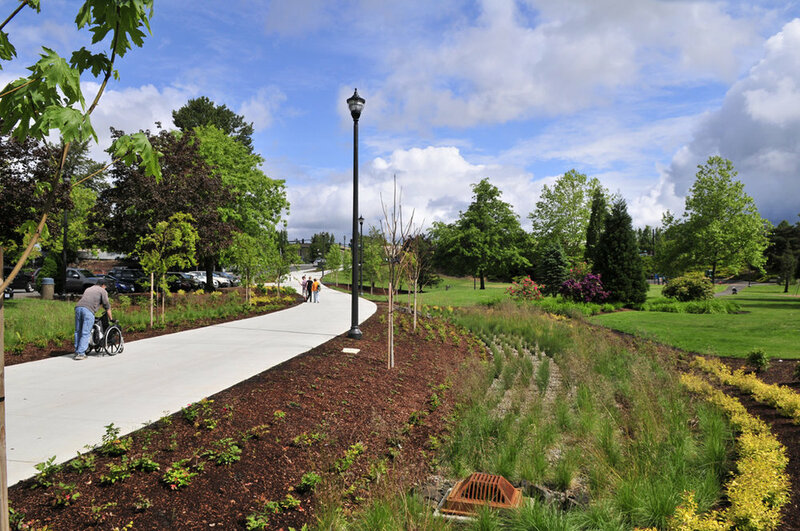 GreenWorks design responsibilities included: collaboration on design of green streets and rain gardens; public recreational spaces; the Village Green open space; pedestrian / pathway network; woonerfs; greenway enhancement; and overall landscape treatment. The project was awarded the Land Development of the Year Award in 2007 from the National Home Builder’s Association. 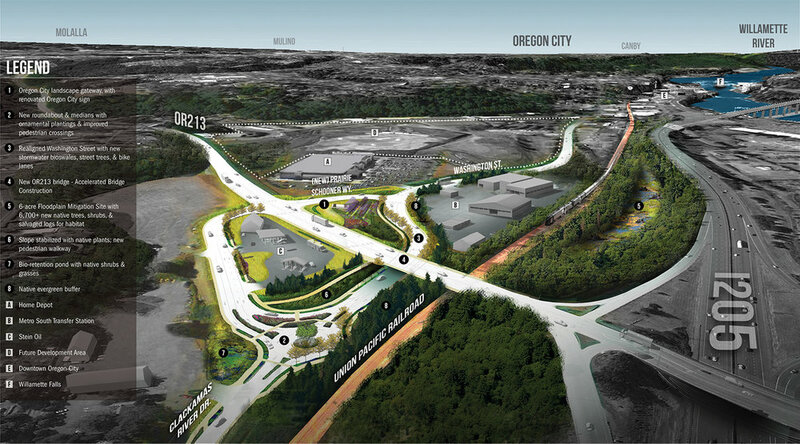 GreenWorks created a master plan for the interior Interstate 5 corridor through the City of Tualatin. The first phase of this involved a comprehensive opportunities and constraints analysis, that identified target areas and potential scope of improvements throughout the corridor. This led to the design of a master plan that provides the conceptual view of long-term and short-term landscape improvements, as well as potential costs. 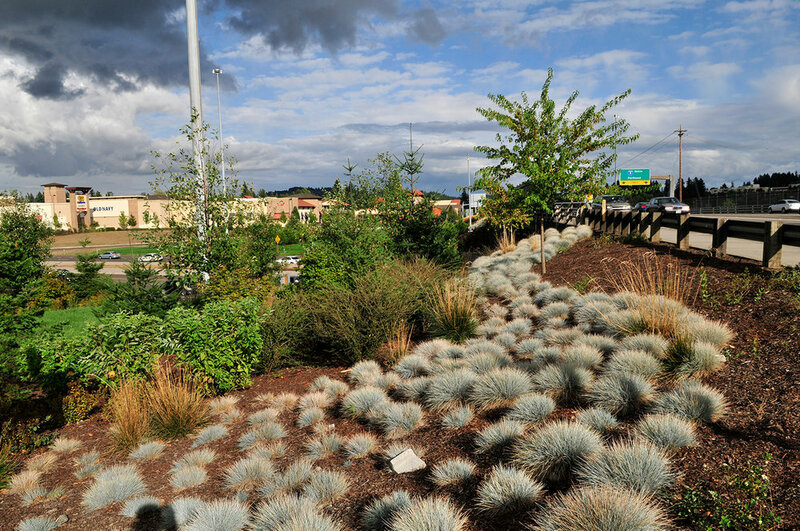 The master plan was approved by Tualatin, as well as regional ODOT staff for compliance to recommended plant species and overall maintenance regimes. The master plan provides guidance for future landscape improvements, opportunities for public-private partnerships, and overall consistency of subsequent projects. The second phase involves the development of a more detailed design of landscape improvements for the Nyberg Road Interchange (phase one). This expansive interchange is currently underutilized and offers the opportunity to become the visible gateway to the City of Tualatin. Design challenges involved working with ODOT for maintenance access and planting apporpriateness made easy through pre-review of the master plan in the first project phase. Since the majority of users for the interchange are in fast traveling vehicles, we developed 3D modeling and photomontage design solutions to represent the user experience at speed. This greatly improved the overall communication of design intent. After developing and refining a number of possible solutions with the project team, including Tualatin and review by ODOT, a preferred alternative was created, and construction documents were prepared. The Washington Way Bridge replacement project replaced an existing 66 foot wide, five-lane, timber-structure bridge that spans 160 feet, crossing over Lake Sacajawea in Longview’s historic Lake Sacajawea Park. GreenWorks worked with a team of engineers to provide architectural design input for a new concrete bridge that complements the historic character of the park and meets better safety needs with wider sidewalks and enhanced lighting. GreenWorks also provided architectural renderings of the proposed bridge design and additional graphic support for two public open houses to solicit public input. Architectural elements considered in the design of the bridge included railing design, layout of ornamental lighting, bridge materials and finishes, and bridge span and pier types. 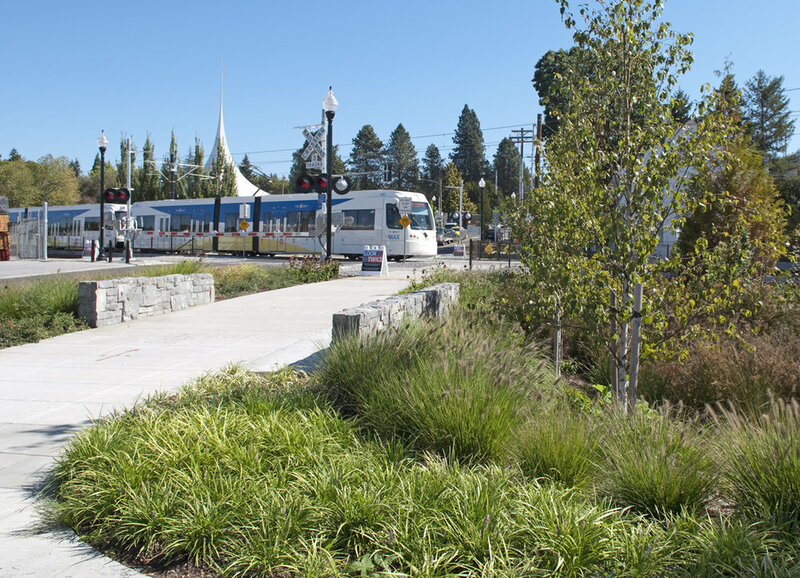 Planting design of the landscape adjacent to the new bridge included plant and tree species consistent within the context of Lake Sacajawea Park.